One of my favourite lighter strategy games from the last couple years was Kramer and Kiesling's perfectly-tuned Asara. Asara is a worker-placement, majority game which slickly used cards for the placement making it feel deceptively different. What stuck with me was just how amazingly well all the overly familiar mechanics in Asara fit together - it was like everything had been playtested 1000s of hours to create that perfect experience. I feel the same about my all-time favourite game The Princes of Florence, also co-designed by Kramer, although PoF is a much heavier experience. The latest game from K&K (I like that!) 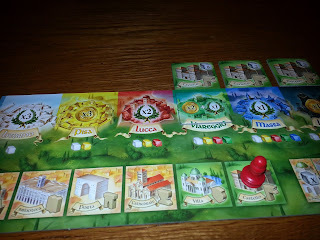 is called The Palaces of Carrara and was up for the Kennerspiel des Jahres award this past year. And after a couple of plays I'm happy to say it's just as magical as Asara. Familiar mechanisms meld together in familiar ways and yet everything feels intentional and fresh. 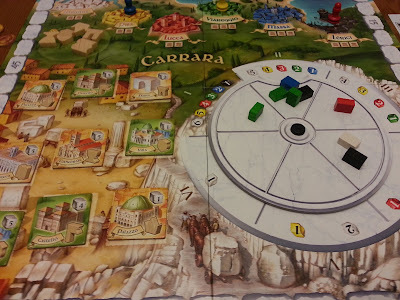 Carrara combines a clever decreasing market for blocks which are bought to let you build buildings. 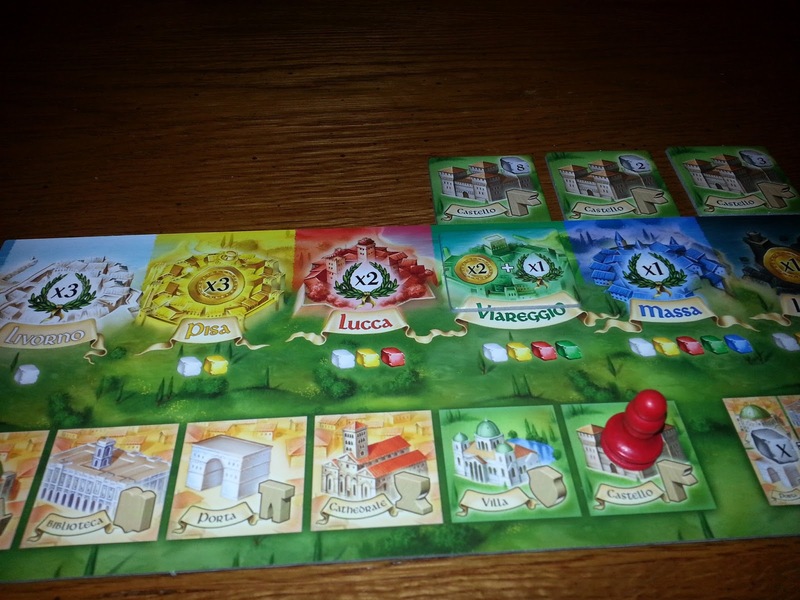 The buildings are then scored in various ways to get players more money and victory points. And everything has been seen before but in this game it all clicks together so damn well! 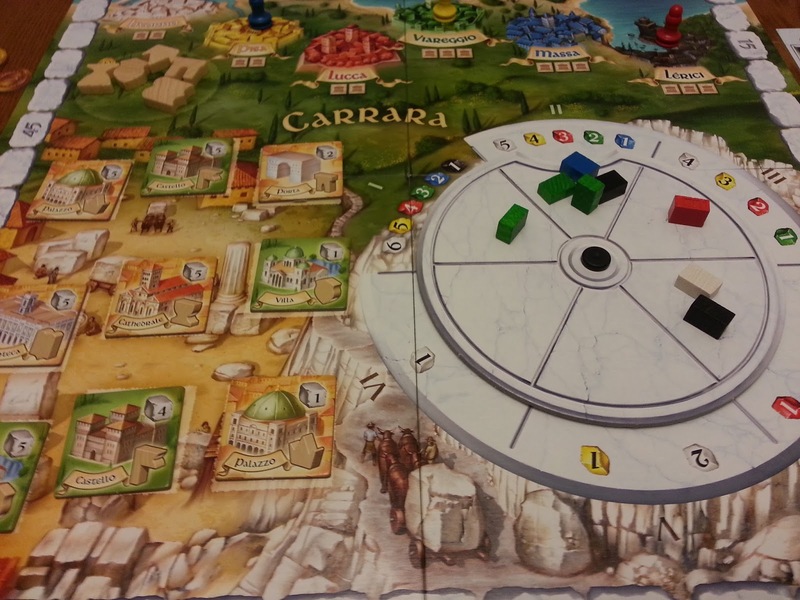 The players choose when and what they score reminiscent of Dorn's classic Arkadia and the "coins to resources to buildings to points" has been done again and again. But the game plays so smooth and quick that it doesn't matter and after the first few turns of my first game strategies and plans were already starting to emerge in my mind. And included with the game are advanced rules which will give the game endless replayability - a set of cards which determine the endgame conditions and probably should be included as soon as everyone's tried the game once. We haven't tried them yet but I think it will be a necessity from here on in. Anyways, only played this a couple times so far but I think the depth will be endless once we bring in the endgame cards. And the feeling while I'm playing every time I get a great deal from the revolving market on expensive building blocks is the same feeling I get from a great find at Winners - SWEET! Very much looking forward to exploring this gem.